The Procter & Gamble Company provides consumer packaged goods in the United States and internationally. The company operates in three global business units (GBUs): Beauty and Grooming, Health and Well-Being, and Household Care. 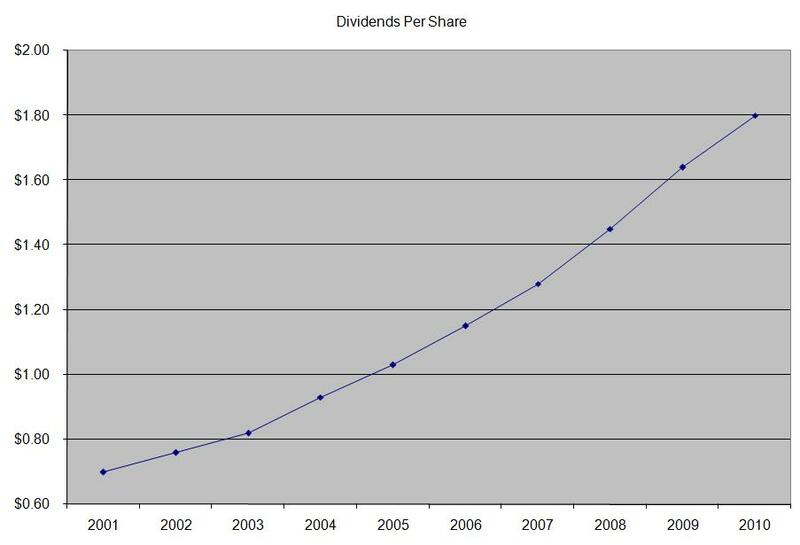 The company is a dividend aristocrat index and has increased distributions for 54 years in a row. One of the company’s largest investors is no other than Warren Buffett’s Berkshire Hathaway. Over the past decade this dividend stock has delivered an annualized total return of 7.50% to its shareholders. The company has managed to deliver an average increase in EPS of 14.50% per year since 2000. 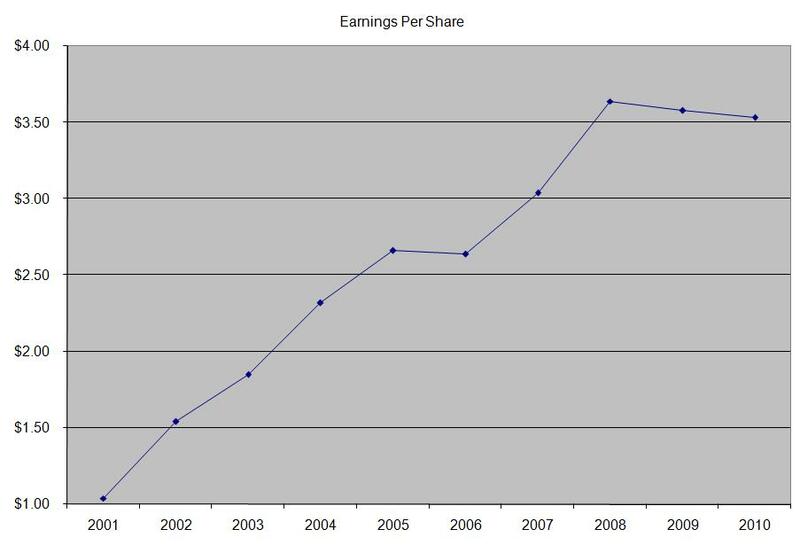 Analysts expect Procter & Gamble to earn $3.98 per share in 2011 and $4.37 per share in 2012. 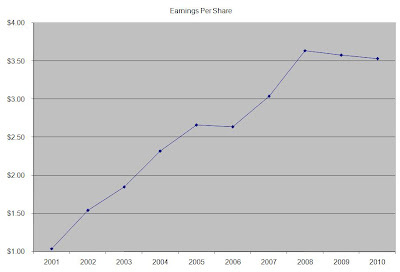 This would be a nice increase from the $3.53/share the company earned in 2010. Procter & Gamble is an example of the perfect dividend growth stock. It has strong brand recognition, solid competitive advantages as well as a diverse portfolio of products sold throughout the world. The company strives to generate cost savings, tries to grow through innovation and through acquisitions, while carefully managing the cash flow in order to pay dividends and buy back stock consistently. The company has the benefit of its large scale and sells a diverse number of products that have a broad geographic reach. The company has a consistent revenue stream and is targeting earnings per share growth in the high single to low double digits. 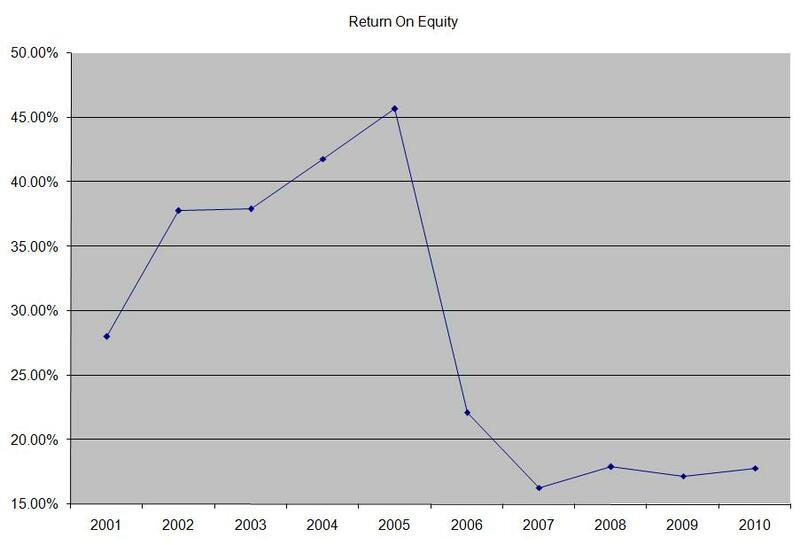 The company’s return on equity decreased sharply after the acquisition of Gillette in 2005. Rather than focus on absolute values for this indicator, I generally want to see at least a stable return on equity over time. The annual dividend payment in US dollars has increased by 10% per year since 2000. A 10% growth in distributions translates into the dividend payment doubling every seven years. If we look at historical data, going as far back as 1975, we see that Procter & Gamble has indeed managed to double its dividend every seven years on average. After decreasing steadily throughout the decade, the dividend payout ratio increased above 50%, mainly on low EPS growth during the 2007- 2009 recession. 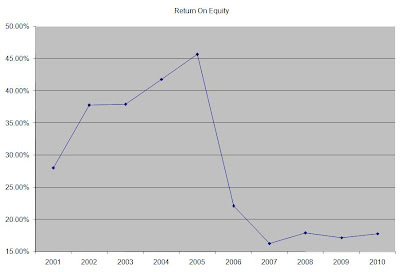 Based off forward FY 2010 EPS however, the dividend is adequately covered from earnings. A lower payout is always a plus, since it leaves room for consistent dividend growth minimizing the impact of short-term fluctuations in earnings. Currently, Procter & Gamble is attractively valued at 16 times earnings, yields 3.00% and has a sustainable dividend payout. I would continue monitoring the stock and will consider adding to a position in the stock on dips.